The September 1932 issue of Radio Craft contained an article titled, "Radio a la Cortlandt Street!," the original "Radio Row" located at the corner of Cortlandt and Washington Streets in Manhattan (the intersection does not appear to exist anymore). It was a mecca of new and used electronics components and assemblies. After World War II there was a huge supply of surplus parts and equipment made available to the public as a means to clear out inventory and also as a "thank you" to the citizens who voluntarily donated critically needed panel meters, tuning capacitors, connectors, and other items to the War Department. That really helped the market boom. 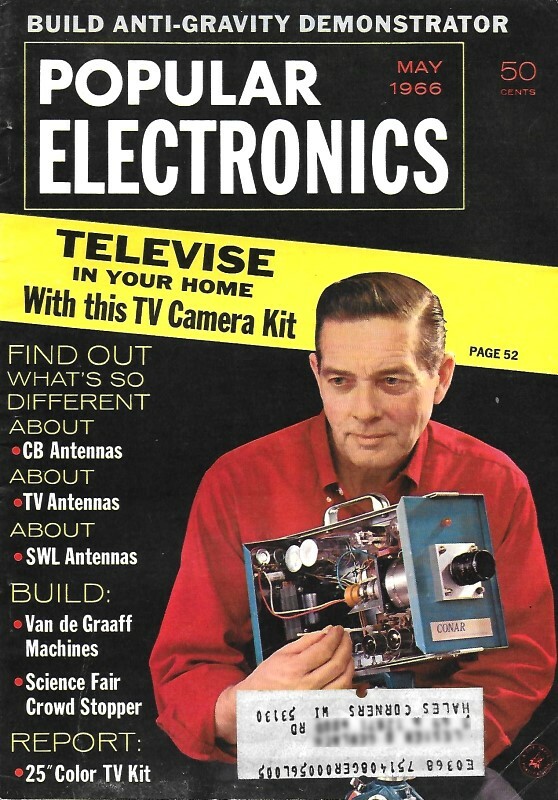 Post-war electronics magazines were chock full of ads by dealers selling surplus electronic and mechanical supplies. 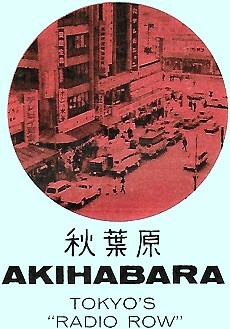 Most big cities of the era had a Radio Row, including Akihabara in Tokyo. This article tells its story. That miniature TV set your friend brought back from Tokyo - ask him where he bought it and chances are he'll say. "Along the Ginza somewhere." Ask if he went to Akihabara first, and he'll probably say, "Aki ... what?" It's not surprising that this part of Tokyo is unfamiliar to most visitors. It isn't a noted tourist attraction. And for shopping, it's the Ginza department stores with their English-speaking store guides that attract most tourists. But five minutes away from the Ginza (on the Yamate line), within the shadow of the Akihabara elevated subway station, is the largest electronics and high-fidelity market in Tokyo - and probably the whole of Asia. This is where shrewd shoppers for radios and TV sets go hunting for real bargains. Here, discounts start at 15% and have been known to go as high as 50%. 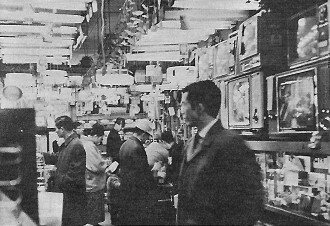 As you get off the train at Akihabara and walk with the crowds to the market place, the din of a hundred television sets, hi-fi's, transistor radios, and tape recorders drowns out the noise of the trains overhead. Into a triangle about an acre in size are jammed half a dozen arcades containing scores of little shops and stalls. Most of the shops carry items for which there is a heavy popular demand: 7-lb. TV sets; matchbox-sized radios; 2-lb. tape recorders; radio/phono combinations as big as a box of Kleenex; and pocket-sized CB transceivers. Many shops specialize in high-fidelity sound equipment; if some of it looks familiar, it may be because it is marketed all over the world under different names and at very different prices. 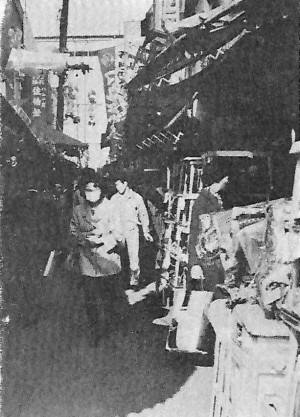 Other stalls sell fluorescent lights, stoves, refrigerators, and household appliances. And still others handle more sophisticated items such as oscilloscopes, test equipment, radar and sonar for pleasure boats, Geiger counters, and remote-control radios for model builders. Since the second World War, technologic advances and the low cost of labor has made the manufacture of transistorized electronics one of Japan's leading industries. The low prices and tax-free-for-tourist laws practically dare a visitor not to buy. Akihabara is essentially a discount market. And while haggling (as many of the G.I. 's knew it) has died out, the shopkeepers will not always turn a deaf ear to a little dickering - if it is done right. On $10 or $15 items, the shopkeeper will probably stand firm on his 15% discount. But if you are interested in $100 to $200 worth of amplifiers, tuners, turntables, and speakers, feel free to drive as hard a bargain as you can. If the shopkeeper has any command of English, he will be eager to bargain in that language. But this "command" can be deceptive. A sale on the verge of closure can easily stall because of a simple misunderstanding of a word or gesture. 1f you are planning to spend a large sum, it would be wise to secure an interpreter (for about five dollars a day) through the Japan Tourist Bureau or the Tokyo Chamber of Commerce. Your interpreter will be able to express your wants honestly and do it in a manner familiar and acceptable to Japanese businessmen. From the time Akihabara opens at 8 :30 a.m. - an hour earlier than the downtown stores, to the time it closes (later than the downtown stores) at 7 p.m. - and still later in the summer, there is a continual scene of happy confusion. Trucks constantly unload cases of factory-sealed merchandise into the already crammed aisles. Whole families come and spend the day selecting a new "tele-bee." Department store buyers from all over Japan conclude enormous deals over little cups of green tea. And scores upon scores of people just stand around taking in the action. If you've ever seen Cortlandt Street in New York, you will have a good idea of what Akihabara in Tokyo is like. But while the days of "radio row" Cortlandt-Street-style are numbered, Akihabara is still going strong.